Air Conditioning Service - Click Below to Call! If you're in need of Air Conditioning Service in Rockwall TX or ANY surrounding area, you've come to the right place. We understand how HOT it gets in North Texas during the summer... and every other season... so having a working Air Conditioning unit is a must. As the weather in the DFW area changes, so does the output on your homes Heating and AC System. Call a company you can trust. Call Rockwall HVAC Repair. Our main goal is your satisfaction with our services, promptness and pricing! We understand that you as the customer, will have needs that are specific to your home, and we intend to help in the most efficient way possible. When it’s hot, dry and unbearable in the Texas heat, your AC unit in your home is put to the test. The summer will place a big demand on your central air conditioning unit, and it’s important to make sure your system is in excellent operating condition and is up to speed with repairs and tune-ups. Currently, Rockwall HVAC Repair is offering a $79 Residential AC Unit Tune-up! You can call us today at (972) 521-3915 to schedule a free estimate - we’ll get you taken care of and cooled off in no time! We want to thank you for viewing our website for AC Repairs and HVAC Repairs in Rockwall, TX. We hope to see you soon! Another core function of Rockwall HVAC is our heater repair services. Most people in Central and North Texas don't really worry about the well being of their residential heater until it's almost too late! Many home owners and business owners will wait until November or even December to get their heater serviced, when it's already freezing cold outside! This can create some uncomfortable situations for obvious reasons! Waiting this long to get your annual heater maintenance done can leave you and your family in very cold conditions for a week or two, possible even forcing you to leave your home and stay in a hotel or relative's home until your heater can be fixed or replaced. One important thing to note is that Rockwall Heater & HVAC service and heater installation comes with a warranty on all of our heating systems. Just be sure to ask our service technicians about the different units and warranties that we are currently offering. They will be able to tell you all about the different heating unit sized and promotions that we currently have. Call Us Today to set up AC Repair Work or to Schedule a Free Estimate on a New AC Unit! 1. Speedy and Efficient Rockwall AC Repair - We don't like long wait times and know you don't either. We make it a point to do the job right the first time, so that we can make it to our next client in a timely manner. 2. Only the Best; Experienced - Our Licensed and Professionally Trained Technicians provide only the most Dedicated Service on all Air Conditioning brands. 3. Licensed and Bonded - We operate fully licensed in the state of Texas and are proud to call DFW home. 4. Staying Ahead of the Competition - Our Certified Rockwall Technicians continue to expand their knowledge-base as new products and methods come about for AC in Rockwall Tx. 5. Free Estimates - We will happily come to your home to give you a thorough and detailed estimate on replacing your old Rockwall AC unit. 6. All Major Brands - Whether you need AC Repair in Rockwall or are looking for new Air Conditioner Units in Heath or Royce City, we will service all major brands. 7. Competitive Pricing - We understand you have options, and there are many AC Repair Companies to chose from. We offer competitive prices and special offers for all seasons. One of the many headaches that homeowners have to face with on a regular basis is air conditioning units and climate control systems that are either faulty or simply not build to last long. Our HVAC company makes sure that whatever AC unit we are purchasing for our customers is absolutely perfect for their home or business. We need to make sure the correct size HVAC unit is purchased, and make sure that the cooling power it has is adequate for the size of space it will be cooling. Same goes for heaters. We need to make sure that the heating unit or electric furnace that is put into place is adequate for the amount of space it will be responsible for heating. That last thing you want to to have your heater go out half way through the winter season! 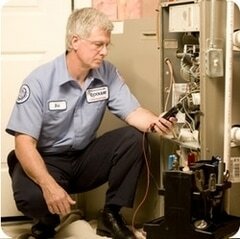 It's better to have your heating system checked and/or replaced well before the coldest part of the year comes around. Many HVAC Companies in the Rockwall area are good at giving out estimates, but not so great about getting the job done! At Rockwall HVAC Repair, we always want to make sure that we're getting the job done on time and on budget. 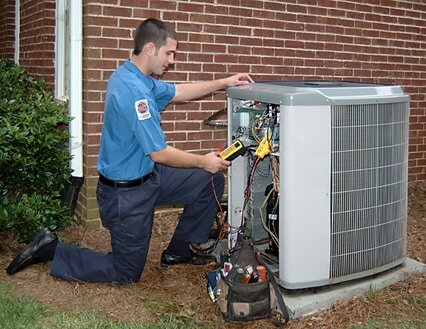 This is our specialty - making sure that our customers' HVAC needs are met with excellence. ​HVAC Repair is always in high demand. Excluding the months of October through February, we are constantly being contacted about HVAC units breaking down and AC condensers that are dying and need to be replaced. In Rockwall TX, having a properly working HVAC unit is imperative! It gets really, really hot during most months throughout the year, and not having a working air conditioner can leave you feeling miserable in your own home. We do everything we can to prevent this by offering the highest quality HVAC services in Rockwall TX.